The more I think about this project, the more excited I become. Brilliant idea, Richard! Exciting to see this coming together! Also, I was just reminded of a novel that touches on this: Julian Comstock by Robert Charles Wilson. It's a post-collapse story where the narrator grows up scavenging books from ruins and becomes a writer as he follows his friend to war. In the army, he meets up with a journalist who introduces him to typewriters. 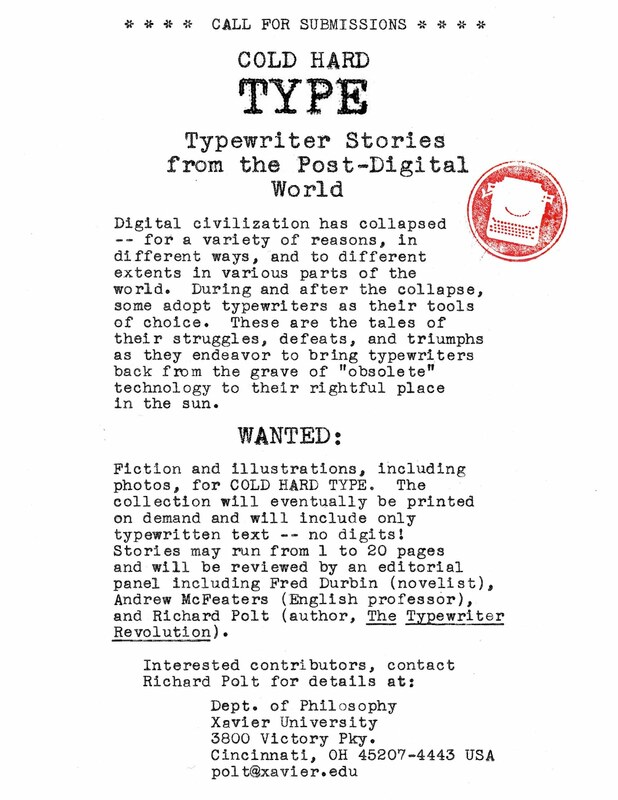 The book isn't necessarily about him, but his growth as a writer is a part of the story, and getting his own typewriter allows his career to take off. How is it that NaNoWriMo has lost any attraction, for me, but this sparks unfettered enthusiasm? I printed the call for submissions out, and carried it around for a few days, pondering what I could write. When my wife saw it, she first offered me a story concept she'd been thinking about... and then took back the offer; we might both submit something for this project, now. Good thing we don't have to share a typewriter!